President-elect Trump has voiced his disdain for auto manufacturers who build cars in Mexico instead of the United States, even threatening to impose a 35 percent tariff on cars built in Mexico and sold in the states. 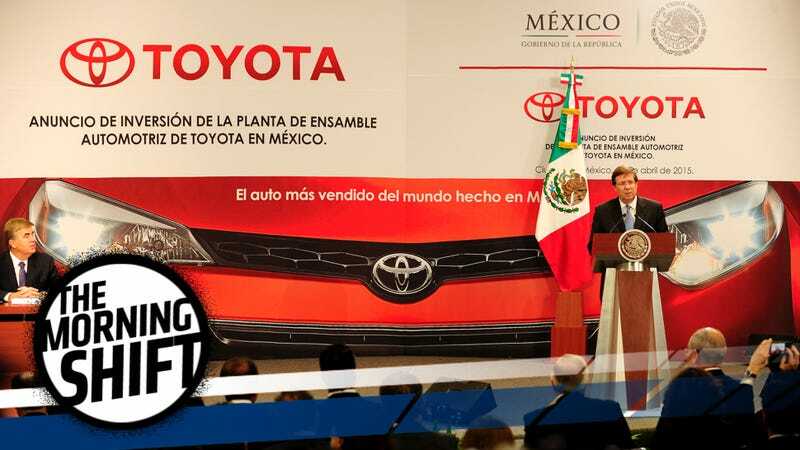 TMMGT will produce the Corolla, the top selling car in the world, beginning in 2019, and employ approximately 2,000 team members from the Bajio region. With an annual vehicle capacity of 200,000 units per year and a one-billion-dollar investment, TMMGT will serve as the model of manufacturing for Toyota thanks in part to its design built on the anticipated Toyota New Global Architecture (TNGA). TNGA will serve as a catalyst for building more models on common platforms, making intelligent use of common parts, and fully leveraging Toyota’s supply chain. The Dodge Grand Caravan has been rolling out of Windsor Assembly plant since the mid 1980s, when the model helped birth the new minivan segment under Lee Iacocca’s leadership. An information package distributed to Unifor members at a supplier in Windsor, Ont., during a ratification vote Nov. 7 appears to firm up the end date of the Dodge Grand Caravan. A letter of understanding sent from Magna International to Unifor says its Integram Seating plant will cease delivery of the Caravan seating to FCA’s Windsor assembly plant in July 2019, likely marking the end of the minivan’s run. We’ll see how long the world’s first minivan sticks around. Jaguar has always been a niche brand, rarely selling more than about 1,500 cars each month to its narrow U.S. customer base. But last year, with the launch of the more mainstream, entry-level XE and the cash-cow F-Pace crossover, Jaguar was hoping to change that. And it looks like that plan worked. Tata Motors swung to a quarterly profit on the back of surging sales at its Jaguar brand...Net income was 8.28 billion rupees ($123 million) in the three months through September, compared with a loss of 17.6 billion rupees a year earlier, Tata said in a statement on Monday. The Jaguar Land Rover unit posted a profit of 244 million pounds ($305 million)...Jaguar’s sales surged 84 percent in the quarter on demand for the brand’s XE sedan and F-Pace SUV. In a recent press release from Tata, the company said that in October, Jaguar sold 3,219 cars, a 226 percent increase over the 998 vehicles it sold last October. This October, the XE alone almost outsold the entire October, 2015 lineup, with 941 sales. But even that doesn’t compare to the F-Pace crossover, which dominated with 1,240 sales last month. It’s no surprise that Jaguar’s decision to go a little more down-market with the XE, and to release a crossover paid off. Whether the brand can continue the momentum to become more competitive with the Germans remains to be seen, but this week’s electric I-Pace crossover debut sure looks like a step in the right direction. Earlier this month, one of president-elect Trump’s senior policy advisors said the new president plans to review the fuel economy and emissions requirements that have forced automakers to build cars with low profit margins that the American people don’t necessarily want to buy. [California] has more people and cars than any other [state], giving its regulators an outsize influence on what automakers build. And lest anyone think differently, California has no intention of backing away from clean-air enforcement, even if Trump undermines federal mandates, said Dan Sperling, a member of its powerful Air Resources Board. There’s still a need for cooperation between the state and federal regulators. Before California can extend its ZEV mandates beyond 2025, it will need permission from Trump or his successor — or threaten to sue, a step it’s taken before. In the meantime, the Republican-controlled Congress could amend the Clean Air Act to remove California’s ability to set its own standard, or for other states to adopt similar plans. Congress could slash the EPA budget. Automakers may be in a position to promote a compromise between Trump and California, since they need rules that let them sell the same cars in all 50 states, said Robert Bienenfeld, assistant vice president for environmental policy at Honda Motor Co. in the U.S. So for everyone who thought Trump would get rid of emissions regs, and automakers could line their pockets with cash from trucks and SUVs: don’t forget about California. They’re not budging. China’s Leshi Holdings said on Tuesday it had secured commitments for $600 million to support its automotive unit and LeEco high-tech business, which has been grappling with a cash crunch. In a statement sent to Reuters, Leshi said the fund commitments came from more than 10 Chinese companies. An initial tranche of $300 million would be delivered by the end of the month and be invested in the auto business and LeEco Global. Reuters says LeEco has already spent $1.5 billion on its electric car projects. And considering that even Apple has had to cut back its autonomous vehicle program, its no surprise that critics in the industry have been waiting for LeEco to quite as well. Maybe this loan will help them get a car into production, or maybe it’s too little too late, and it’ll only keep the project alive for a few months longer. Who the heck nows, as LeEco has been a bit of a mystery since day one. Neutral: Is Fiat Chrysler Smart To Kill Off The Cheaper Caravan? It’s the original minivan, which was the epitome of basic and practical transportation for a big family. Now Chrysler thinks all big families need vans with televisions and vacuums and holosuites. Is the big basic van dead? Why Did This Alfa Romeo Giulia Get Stuck On A Normal Driveway?